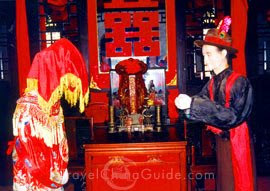 The marriage procedure in China is different to what you might expect in the other countries. 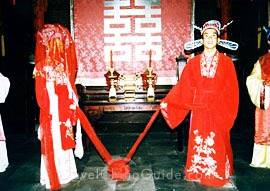 To marry in China or to marry in other cities of China the requirements and procedures are mostly identical. I have heard of one or two accounts that vary but in the main the following information should apply to China. The actual marriage formalities are carried out in a very matter of fact way, just a visit to an official marriage office with the required documentation and if all is in order, then you are married. Casual clothes are acceptable. 1. Requirements vary between provincial marriage offices in China and you should first contact the local Chinese Marriage Bureau where you are planning to get married to confirm their requirements. 2. Most offices require that you first obtain an Australian Certificate of Single Status (otherwise known as a Certificate of No Record), indicating that you are not currently married. These are obtainable by mail from the Registry of Births, Deaths and Marriages in the state in which you were resident in Australia . 3. Alternatively, the Chinese Marriage Bureau may also accept a Certificate of No Impediment to Marriage (CNI), which is a certificate in both English and Chinese, obtainable from an Australian Embassy or Consulate. Providing this certificate entails a fee, so it is best to confirm first with the local marriage office if it is required. 4. Once you are married in China , the Chinese authorities will issue an official Chinese marriage certificate. You do not need to register your marriage again in Australia, however, if you intend to use your marriage certificate in Australia , you should contact the Chinese Public Notary Office to arrange for an official notarised translation of the certificate.